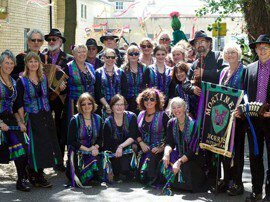 Mortimer’s Morris is a lively women’s side based in Nottingham. 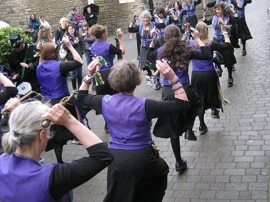 We perform morris dances from the North West tradition with enthusiasm and style. Mortimer’s Band contributes an unusual sound with tunes from across Europe. Our joint aim is to promote excellence in practice and carry North West Morris forward for future generations to enjoy. With a distinctive kit and band, Mortimer’s Morris has become a familiar sight at prestigious events throughout the country. See the details for our open practices – where and when we practice.